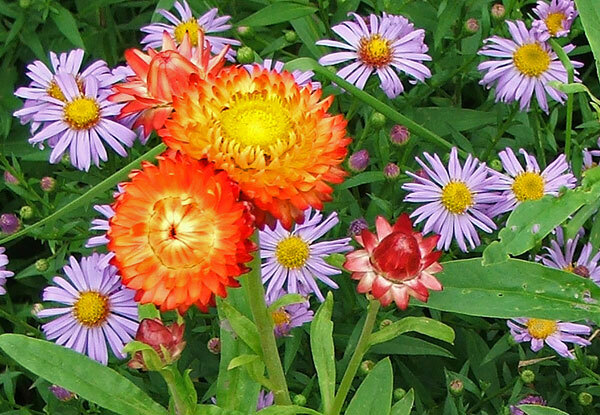 I used to grow annual Helichrysums for fun - I called them everlasting daisies, or strawflowers, and would use them in dried flower arrangements. The colours were just delightful, but I didn't think they had a place in a natural garden full of greenery. Ha! I was wrong. As I discover I am regarding their name. 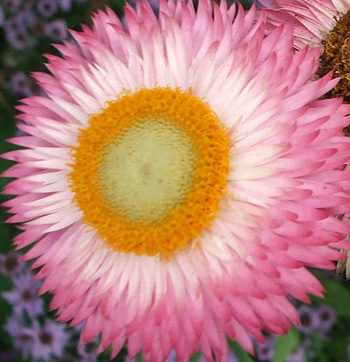 Wikipedia tells me it changed to Xerochrysum bracteatum in 1990. Oops. I am sooooooo out of date! When I moved to my large rambling country garden nothing that looked artificial was allowed - well not in the beginning. It must have been the influence of all those English country gardening magazines I was reading. Then, quite by chance, I bought a random selection of left-over seed packets, and Helichrysums were one of the varieties. Of course they grew easily, and by the time I planted them out near the compost heap I'd forgotten what exactly they were. Some sort of annual daisy, I thought, which would be pretty for three weeks and then do no more. Aha! What a delightful surprise was in store - and how pleasant and colourful it would become when I tipped the latest scraps on the compost! But best of all, the Helichrysum flowers have been extremely everlasting, from the beginning of summer right into late autumn. They seem to be such sensible plants - as the older flowers fade, new ones appear. Nice work! And they don't flop about at all. I'm not at all interested in picking them, either - the colours look so cheerful in the garden. And I want more, so I've collecting some seed.